The elevated relationship sends a clear message to China. At the 3rd ASEAN-U.S. Summit in Kuala Lumpur, both sides elevated their relationship to the “ASEAN-U.S. Strategic Partnership.” While “strategic partnerships” abound in the Asia-Pacific, this one is symbolically important for several reasons. It comes amidst growing tensions over China’s assertive behavior in the South China Sea (SCS). Two ASEAN states, the Philippines and Vietnam, are engaged in fierce territorial claims with China. Moreover, Indonesia and Malaysia are increasingly concerned about China encroaching on their maritime sovereignty. And Beijing’s massive “land reclamation” activities in the SCS has all too clearly demonstrated to Southeast Asian littoral countries that China seeks to change the regional security order with blatant disregard for their strategic interests and sovereignty. China’s challenge to Southeast Asia’s order has put considerable stress on ASEAN. Primarily designed to deal with economic and political issues rather than questions of hard power and security, ASEAN runs a real risk of being “divided and conquered” by China, whose large checkbook seems particularly irresistible for smaller, land-locked members. Beijing’s participation in “ASEAN plus” forums has also provided it with the power to veto criticism of its maritime behavior. For instance, the recent ASEAN Defense Ministers Meeting’ Plus (ADMM Plus) in early November ended without a joint declaration after China blocked a push by some ASEAN nations, the United States, and Japan to include concerns over the SCS. In short, ASEAN members see eye-to-eye with the United States when it comes to the importance of a rules-based order in the SCS and the ways to manage maritime disputes. This statement flies in the face of Beijing’s campaign to blame “countries outside the region,” particularly the U.S., for creating tensions in the region. In an obvious attempt to counter the ASEAN-U.S. joint statement, China immediately launched a “five-pronged” proposal aimed to keep the SCS issue between China and ASEAN. committed to strengthening democracy, enhancing good governance and the rule of law, promoting and protecting human rights and fundamental freedoms, encouraging the promotion of tolerance and moderation, and protecting the environment. Both sides have indeed come a long way since former Malaysian Prime Minister Mahathir and Singapore’s Prime Minister Lee Kuan Yew promoted “Asian values” as a distinct antithesis to the values and traditions of the West. This argument – which was favored by Beijing – stressed that individual human rights mattered less than the need for collective security and economic growth, and that democratization had destabilizing effects. To be sure, we don’t suggest that the ASEAN-U.S. Strategic Partnership means that ASEAN members have now teamed up with Washington against China. “Hedging” between China and the United States remains the preferred strategic option for most countries. 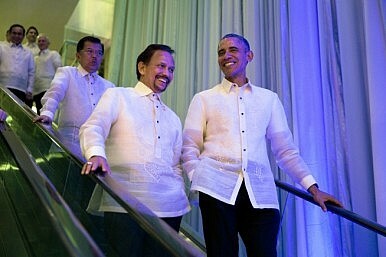 That said, the elevation of ASEAN-U.S. relations shouldn’t be dismissed either. It is an important signaling exercise by ASEAN countries towards China to stop its bullying behavior in the South China Sea. It also signals that ASEAN regards the U.S. as an important player in the future regional security order. It comes alongside stronger pushback against China’s maritime assertiveness by individual Southeast Asian nations and growing U.S. resolve to conduct Freedom of Navigation Operations (FONOPS) within 12 nautical miles of China’s “artificial structures” in the SCS. It is designed to show to Beijing that its behavior might well incur significant strategic costs. Seen in this context, the elevation to “strategic partnership” is far from trivial. Ben Schreer is Professor in Security Studies at Macquarie University in Sydney and Head of the Department for Policing, Intelligence and Counter Terrorism (PICT); Sheryn Lee is an Associate Lecturer at PICT.